As I mentioned in my last post, I am a passionate sports fan. I knew I would see at least one soccer game football match while in Europe, but I did not expect to see the greatest sporting event I have witnessed in person on my second night. A quick description of who was playing and why: qualifying for Euro 2016, which is like a World Cup for European countries, began last week. Teams were placed into six-team groups and will play a home-and-home round-robin schedule that determines who makes it into the tournament. 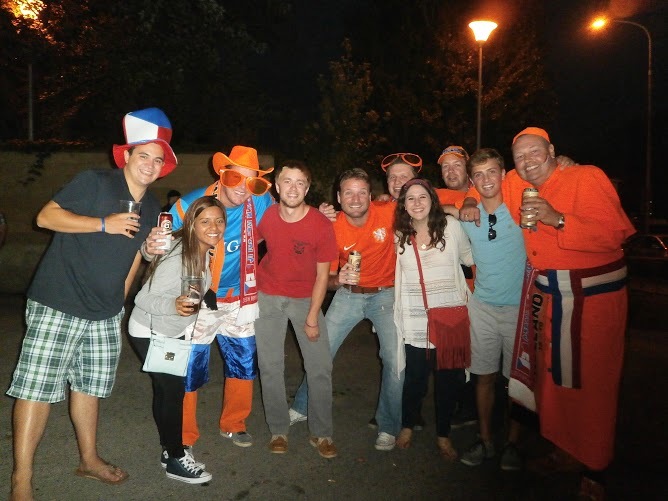 The Netherlands, who lost in the World Cup Final, played at the Czech Republic in both countries’ first match of qualifying. Both countries played close to their best teams, since a good start in qualifying is crucial. Following an orientation session, four other adventurous soccer football (I’ll get it eventually) fans and I navigated our way to Stadion Letná, despite not having tickets or knowing what to expect. Worst case, we thought, we would see the stadium and find a nearby pub to watch the game. We ended up getting off the tram a stop early, because we saw some festival-looking event that seemed worth checking out. We made a great decision. This event turned out to be a large public tailgate for the match. Let me tell you, the Czechs know how to tailgate. 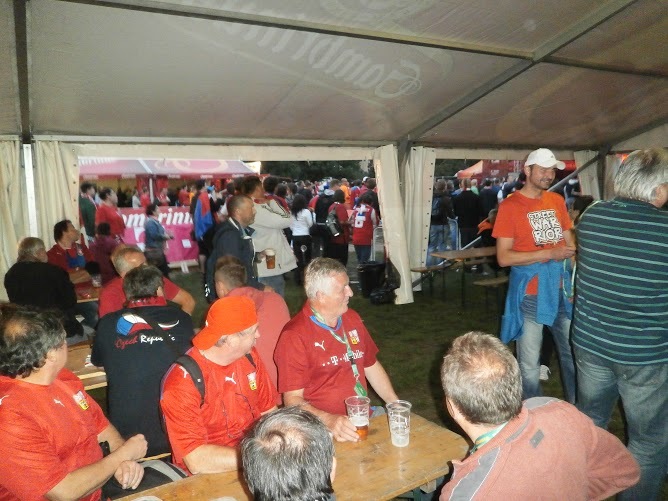 There was a huge screen playing highlights of former Czech matches, lots of games, and, of course, excellent pivo (beer). As kickoff neared, we walked a couple blocks to the stadium, so we could get a greater idea of what the atmosphere would be like. Let’s just say the rundown Stadion Letná would not pass any NFL team’s requirements to serve as a home. But it’s the fans that make a stadium great, and the passion both the Czechs and Dutch had around the stadium was unparalleled to anything I have seen. The closest comparison I can think of is SEC football fans, and that’s still a stretch. One other thing that struck us was the amount of people selling tickets. We never intended on attending this match, but after we did some asking around to gauge prices, collectively, we said let’s do it. And so we did. Buying tickets can be hard when both sides speak the same language, so buying them with some people who spoke little English was a struggle. But it all worked out. After each of us found a ticket, we regrouped and expressed our shock in what was transpiring. Our tickets were not together so we made a meeting plan and went through the gates minutes before kickoff. All the hype of the atmosphere that surrounds a European football match is actually not hype at all. It is an accurate description of all the madness –Constant cheering, never-ending singing, clapping for good plays, yelling at the referees– that goes on for 90 minutes. And when the home team scores, all hell breaks lose – especially when the goal is this good (Only watch the first minute). This singing seen in this video went on constantly. Because I didn’t know what they were saying, I contributed by clapping. The Czechs clung to a 1-0 lead at the half, but a Dutch goal felt imminent. Four of us regrouped at half, still full of shock, and managed to find some seats near each other for the second half. Sam, who bought the cheapest ticket, couldn’t watch with us because his seat was actually so good that he couldn’t leave his section. Go figure. Not surprisingly, the Dutch equalized early into the second half, and looked to be on its way to a come-from-behind win. But the Czechs defense fought off attack after attack, and even created a few chances. If the Czechs continued to hold tight, it looked like they could cling onto the tie, which would have been considered a success. And then this happened. If you’re too lazy to click on the link, here’s what transpired: In stoppage time, a Czech player fired in a cross, which a Dutch defender tried to head to safety. Instead, he headed it right off the post, and it redirected to the wide-open Pilar who easily tucked the ball in the back of the net. GOOOOOOOOL! The stadium absolutely erupted. Screaming, cheering, high-fiving, hugging, kissing – it all happened. And it happened all the way through the final whistle, which came just moments after Pilar’s game-winning goal. And it carried outside the stadium as well. I truly have never seen anything like it, and I am sure I never will again. And this was my second night. A video that shows the moments after the winning goal. 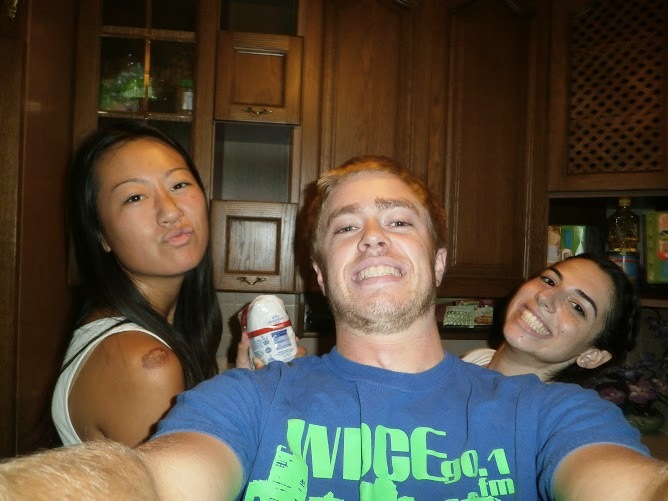 Two of my three female roommates and I in our new kitchen. That’s right, I am the only male in my flat. More on that to come. This entry was posted on Thursday, September 18th, 2014 at 3:11 pm and is filed under Fall 2014, Jack in Czech Republic. You can follow any responses to this entry through the RSS 2.0 feed. You can leave a response, or trackback from your own site.